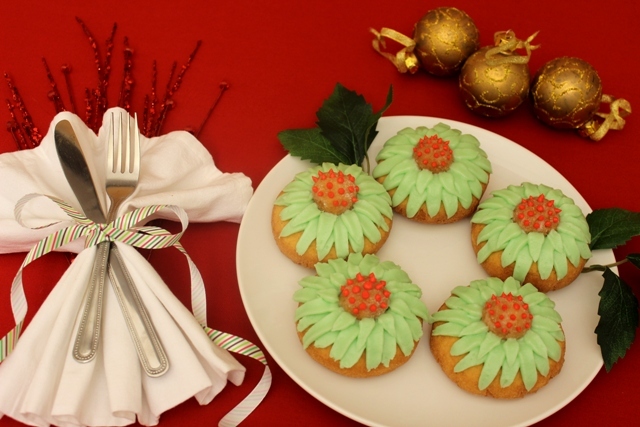 The Many Uses of Buttercream, Part 6: Frosted Doughnut Flowers! Sadly enough, our buttercream extravaganza is almost coming to an end. But don’t shed those tears just yet: We still have a couple of fun and tasty ideas up our sleeves! This week, we think you should forget about those boxed doughnuts with the barely-there frosting. Stir things up a bit and frost your sweet rolls with some buttercream icing instead! A rich layer of frosting atop a fluffy doughnut makes it the ultimate comfort food, and it opens up a whole new realm of crafty possibilities! Lay out your unfrosted doughnuts on a platter. Then, place one plain doughnut hole in the center of each doughnut. Mix your frosting with food coloring to create your desired colors for the flower petals. (Vanilla, mint and peppermint frosting work well for the Christmas motif!) Using a pastry bag and working around the doughnut hole, pipe the frosting onto the face of the doughnut to make the flower petals. Arrange the doughnut flowers on a platter and garnish them with some mint leaves (or faux leaves) for an extra-real effect. Ta-da! Now you have some lovely—and downright delicious—blooms that will lift everyone’s spirits up in no time flat. Next week, we’ll end our buttercream series with a bang: We’re layering graham crackers with frosting, peanut butter and some yummy chocolate chips! Until we meet again, we want to hear from you: What other crazy crafts would you make if you had a tub of Cheryl’s frosting and some doughnuts lying around? The Many Uses of Buttercream, Part 5: Frosted Pancake Sandwiches! The Many Uses of Buttercream, Part 7: Frosted Graham Stackers!